Yes, folks it's snow, and lots of it. 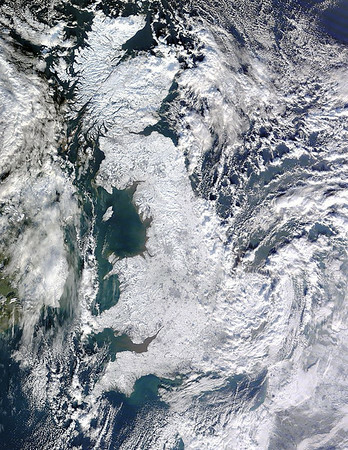 We in Britain don't "do" snow at all, especially down in the south of the country. It also certainly doesn't help things when Mother Nature decides to dump nearly 1½ feet of it across most of the country, including our front lawn, only a few weeks after handing us a couple of inches. This really doesn't play well with our country's current "snow plan" which involves throwing a bit of grit over the roads and maybe, if your lucky, sending out a truck to plough the snow out of the way on the main roads. That said, it has been a gorgeous day today. Clear blue skies and sunshine glistening off the snow blanket. Very pretty indeed. Looks like tomorrow will be clear and sunny too, so I'll be heading out with my camera to get some shots. Update: Apparently all the snow is thanks to the Gulf Stream. Instead of spending winter in Britain, it's popped over to Greenland for it's winter jolly. How inconsiderate.